Nearly everyone considers themselves busy to the point of overwhelmed, but few truly are at that point, or have ever been near it. The following is a test to see how close you are. Say you've spent decades stranded in the Sahara, eventually working out a viable means of scratching out a life for yourself. You've found a small murky water source, discovered places to forage berries and an occasional mouse, and patched together a reasonably safe shelter. You can handle a sandstorm, and scorpions no longer pose a threat. Great resilience and resourcefulness have brought you to the point where you must work hard and do some very unpleasant things, but you know you'll endure. This confidence is an immense gift after years of panic, agony, and regret. You can breathe. You're ok. You've made peace. Say a Range Rover drives by, full of jolly, champagne-sipping rich swells on vacation. They pull over, and the driver informs you that unfortunately there's no room to fit you and bring you back to civilization, however they were about to picnic and you'd be welcome to join in and quaff caviar and foie gras. Would you do it? Or would you decline? To most people, it's a "hell yeah". You'd obviously feel eager - even desperate - to enjoy as much as possible if the opportunity arose. But those who've faced actual deprivation and experienced the grace of acceptance know better. Such a meal would echo for years, thoroughly upsetting hard-won equilibrium. Acceptance and equanimity would have to be rebuilt from scratch. The one meal would do no good at all. It would be 100% downside. The clichéd crazy half-starved hermit who chases away help maybe isn't so crazy after all. Those who've never experienced sustained deprivation simply can't understand. Deprivation is an interesting and multifaceted topic, though much know-how has been lost in this increasingly affluent world. One of the liabilities of wealth is a highly constricted and simplified view of deprivation, which, ironically, is an enormous deprivation. There's way more to the topic than the weepy catastrophe of losing your Stuff (literal or figurative). This posting mostly took the current view of deprivation - as unthinkable affliction - but hints that perhaps it's not as simple as it seems; that some greater value lies just over the horizon of the unthinkable. Going further, one of the Slog's most popular entries, "The Monks and the Coffee", offered an elevating example of how deprivation is merely a state of mind...which means other viewpoints are always available. "Lasagna and Depression" explored how to shift viewpoints - i.e. how the coffee-loving monks got that way - as well as the perils of indulging a mindset of deprivation. And "The Inside Story on Asceticism" turns things around entirely, asking whether the appearance of plenty truly appeals in the end, and observing that well-pruned trees grow more fully. Maybe we've had it backwards all along! It is, quite literally, insane; a narcissistic fantasy world, none of it real. But this is how people with idle time (an unusual human condition found only among the rich) make themselves needlessly miserable. Don't miss this important short article by Tom Rogan, "Sorry, But Jamal Khashoggi Doesn't Matter That Much." I get that some readers will view my words here as callous, arrogant, and even delusional. But I would simply ask them two questions: How did you perceive Saudi Arabia before this happened, and how do you perceive Middle Eastern politics per se? When it comes to the first question, the nature of the Saudi regime has long been clear. It is a regime that has no qualms about restricting human rights, treating women as second-class citizens, and paying off fanatical Sunni clerics in return for political patronage. The House of Saud uses force broadly and without adequate humanitarian caution or strategic hesitation. It beheads not just criminals, but also revered religious figures seeking religious emancipation. In short, the Saudi regime is not nice. Mohammed bin Salman's reform program offers the best and, at present, only means of that nation being able to escape what it will otherwise become: a destitute kingdom full of demographically-explosive young men and Salafi-jihadist ideologues — in other words, a recipe for ISIS 2.0. Much of MBS' "reform" program, as Rogan would surely agree, is cover for self-serving purges and extortions. So even that is not some white horse of virtue. But the alternative would be unthinkable. We never seem to learn that shunning not-the-very-worst guys for their sins creates space for the very worst guys to fill. The problem is that nuanced realpolitik looks awful in the broad view; one appears to be cozying up to bad guys. And the perennial problem with weeding out the sinful is that in the end every last human would be weeded. So while it seems hard to argue against humanism - rewarding goodness and shunning wickedness - it's far more important to consider pragmatic actual outcomes. Unfortunately, that's impossible when the citizenry is consumed by one or another cursedly simple ideology. Beware of sanctimonious people pushing simple solutions! The much-discussed increasing distrust of experts stems from the viral conviction that simplicity always offers the truer path. Maybe we should call it Occam's Guillotine. But how, you ask, does this relate to my athlete's foot? Deeply, it turns out, if you'll think about it. The redress for badness isn't glorious Good, but mere homely "Better". 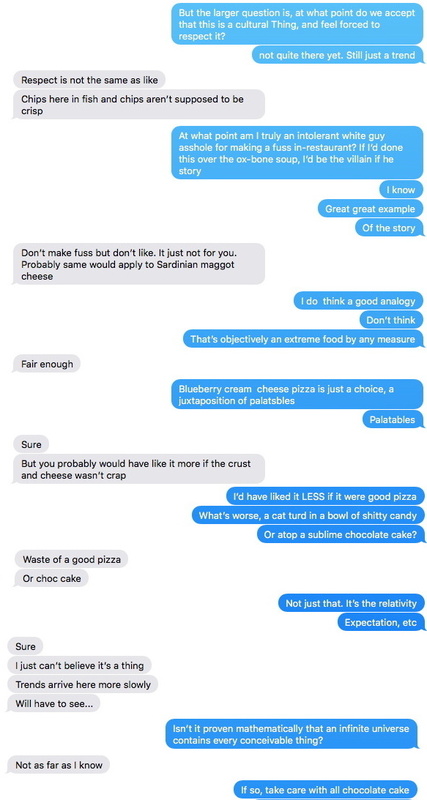 I discussed last night's disturbing pizza experience with my friend Limster, who's currently living in London. It strikes me as interesting and important to note that there's an inflection point that must be recognized when a trend becomes deeply enshrined in culture. There's a vast difference between "I hate this stupid food trend!" (which can be spoken like an insider by an outsider) and "I hate your stupid cuisine!" (which cannot). At another level - I love the complexity of all this! 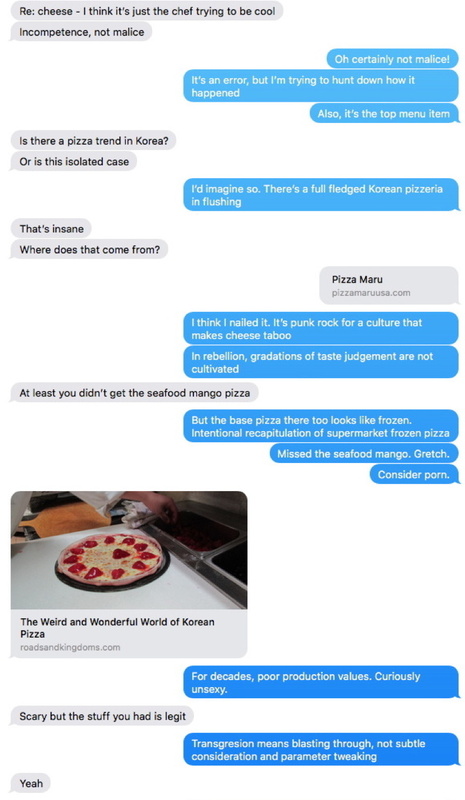 - if I were to bring non-cosmopolitan people unfamiliar with Korean culture and cuisine to a place like this, they'd probably feel compelled to be extremely polite and deferential about the pizza, assuming it's The Korean Way, and therefore impolite to take issue with. It takes considerable experience with and sympathy for the culture to recognize that this is just goofy kids gone pretentiously awry. My eye-rolling is from the perspective of my Korean stem cells, not my American ones. But this makes it that much more necessary to recognize the elusive inflection point if (heaven forbid) this sort of thing actually enshrines in the future. If so, I'll work overtime to seek out the best available version (maybe this was just a bad blueberry cream cheese pizza!) and try to experience it with the most Korean palate I can muster. If I still hate it, oh well. My pref, my bad. In that case, it's me, not them. For the time being, however, it's them, not me....though I'd certainly never condemn anyone for their prefs. There's never anything wrong with liking stuff (I myself like mushy leftover pasta, but readily admit it's a guilty pleasure) and I believe snobbery ("You're bad for liking that!") is downright evil, reducing people's precious happiness. 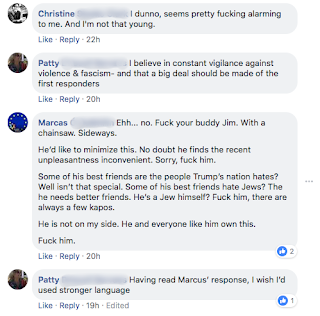 There may come a point where this entire discussion would be an illegal, perhaps even capital, offense; where every stupidity must be treasured and never publicly questioned; where tolerance is infinite, so intolerance is infinitely intolerated. Once again: beware utopias, they get dystopian real fast. I eat very well. Probably 75% of my food is an "8" or higher (using my surprisingly non-ditzy system for rating food and other things on a 1-10 scale), and something like 99% rates above a "6". But last night was quite a treat. I got to experience a full-fledged "2" ("Visceral negative reaction"). This doesn't happen every day. 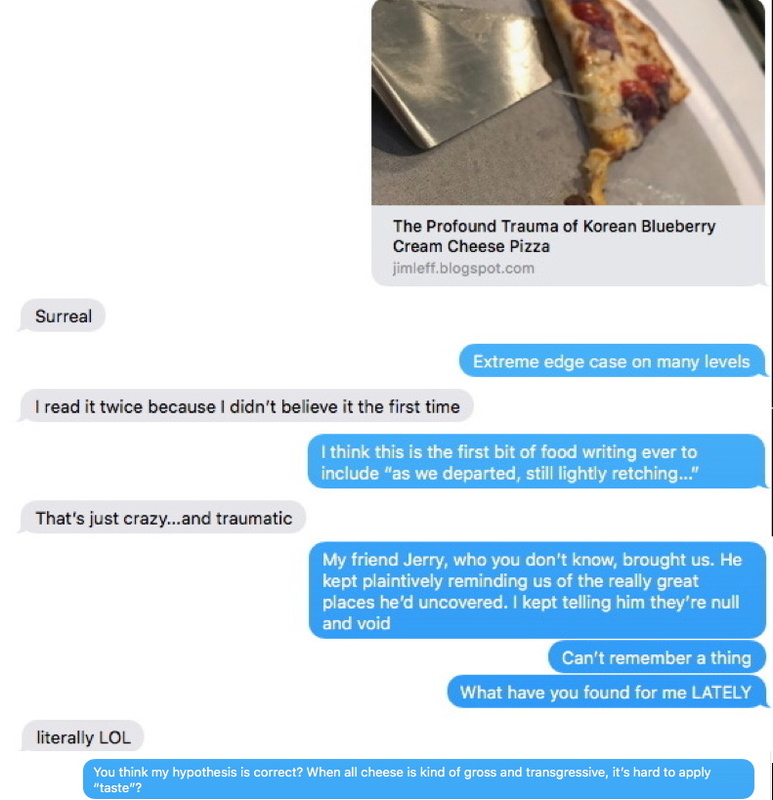 A friend had been curious about the "gelato" pizza advertised by a shiny, flop-sweaty Korean lounge in the eastern extremes of Flushing. So here's how that went. The underlying pizza was merely terrible, like a remaindered frozen pie from the Mama Celeste factory. Terrible hard dough, a cheese blend I believe was generic cheddar plus generic muenster, studded with puckered cherry tomato halves. A “3”. But, adding grievous insult to injury, it was festooned with wrong, very wrong shavings of almond...plus fetid purple globs of blueberry cream cheese. Hanging by a frickin' thread. I didn't process the flavor. The revulsion was instant as some innate bodily process grabbed for a napkin and spat before my brain could even engage. For a solid half hour, I periodically air-flinched ala Derek Jacobi. So what can we learn from this experience? I look at it like this: for these recent Korean immigrants, cheese is a signifier of hipster rebelliousness and the titillating allure of the culturally repulsive. 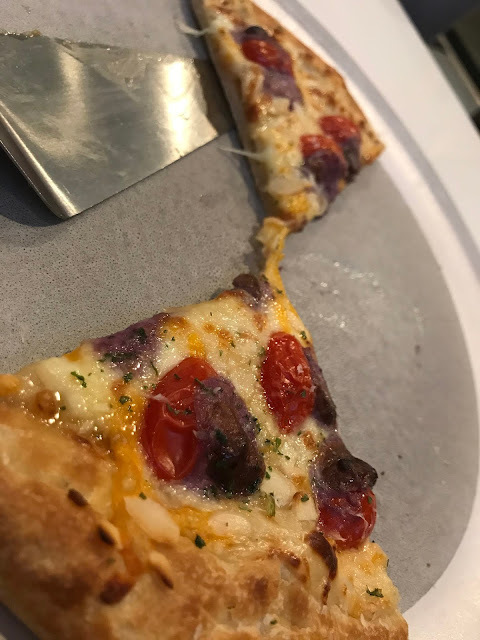 A chef taking a steaming culinary dump via rude blobs of blueberry cream cheese on your pizza isn't a far worse proposition than regular old mozz. It's all treif, anyway. Our repugnance stemmed from a far more granular familiarity with the whole cheese thing than most clients at this place. It wasn't cheap, either. The six small slices of this personal-sized pie, exuding an unholy moisture clearly visible in the vertiginous photo, ran us $20. But our reaction was one of such unmistakable nausea and anguish that the manager immediately dashed over (this was a first; in all my many years of dining out, I'd never before seen this move) to insist that we pay the check immediately because she, uh, [explanation dissolves into incoherence as she mumbles into her armpit]. She had us pegged for prospective walk-outs. Gotta get the money ASAP. Of course we were totally going to pay. And tip, too. But as we departed, still lightly retching, I felt a surreal ambivalence. "This is what happens," obviously mused the entire staff as we walked out, "when white folks, who don't get it, come in here to eat." That's the very last impression I ever want to leave in an immigrant restaurant. I have eaten extreme things to avoid this dreaded gringo-ization. But who, exactly, was the gringo this time? Tuesday, October 15, 2018: It's been a while since the last "Cornered Rat" report, back in July, when the phrase "cornered rat" found 103,400 Google search results. It's now up to 123,000, a gain of 19%. A really important teacher for me was Dave Lalama, who'd played piano and arranged for Woody Herman. I studied with him for just a week - a workshop on arranging (see footnote, below), but it taught me a lot about the music profession, about art, and about teaching. Dave would come ambling into the classroom, a disheveled and hilariously cynical presence, and speak to us without the slightest pretense. A tumble of words straight from the slightly spacey and put-upon soul of the jazz musician. Discussing a particular arranging problem, he'd say "I approach it this way. That's because I like it when it happens like this, but other people like it when it's more like that, so they approach it this other way...let me show you how that works. Oh, and one of my favorite arrangers, Sal Nestico, does pretty much the opposite, and it looks totally wrong on paper but he makes it sound great. Here's what that looks like...."
Every assertion came with a disclaimer and five alternatives, and the word "wrong" was used only as a compliment. The result was an unviably complex flowchart, but I understood that this was the entire point. If you try to do something creative via a flowchart, you're doing it wrong. Creative people shouldn't be instruction-followers. They should certainly be armed with knowledge - moves they can make, plus alternative moves and alternatives to the alternatives. But they should be equally comfortable with blowing it all up and doing something sacrilegious if it brings the best result. If you're someone who needs a bright, clear "procedure", you ought to be an MRI technician, not a music arranger. The casualness - dare I say "lazy fuckdom" - with which Dave informally expanded his mushrooming flow chart was key. For every ten non-creative students who threw up their hands in despair at this apparently sloppy teacher's refusal to tell them how to do stuff, there'd be one manic little automaton geared up to input the entire gigantic branching tree of alternatives, internalizing every decision fork and faithfully rendering the entire tumbleweed in their heads. That ain't it, either. It was abundantly clear that Dave himself was no cold-blooded walking algorithm of orchestrational decision branches. He'd hem and haw a thousand ways, lumpily recall stuff he'd seen or heard, and stir the pot until something ingenious popped out, but he didn't operate in the realm of formulae. It was a matter of bemused, savagely committed playfulness - a strange and rare combination of qualities, indeed, but one which is something of a magic formula. I was the only one in the room who "got" it, but I really got it. Musical arranging is the least understood part of the musical business while also the most conspicuous. Only a tiny percentage of a given musical performance involves the melody you probably key in on. The rest isn't simply "accompaniment", though it seems that way to a melody-focused layman. Those strings providing lush texture have been given notes to play, and those notes are not inevitable. Someone had to devise them and assign them, and every situation is unique (per above, it's not a matter of rote procedure...though procedures do exist and those who follow them - like formulaic screenwriters - will never create an affecting result). You need to decide when the drums come in, and whether there are background vocals, and, if so, how and where they're used and what they actually sing. Pretty much everything you hear is the arrangement. And, again, none of it is inevitable; someone applied a great deal of taste and know-how in making a zillion decisions. The Beatles were only a quartet, but their arrangements (mostly done in studio postproduction) were breathtakingly ingenious. When you arrange a larger ensemble - say, a studio orchestra or big band - the arranger is really the auteur. A composer contributes a single line of notes, but the arranger makes it music. Last year I linked to "Know Thyself: 24 Cognitive Biases", a site offering a PDF that should be the placemat in the diner in philosopher heaven. The people behind this have been busy. They now sell this material as printed wall posters and a card deck (I sent them $45, including shippping, for the full set; it goes to their non profit effort to spread critical thinking skills). Scroll beneath the storefront stuff (at the above "sell" link) for the free downloadable PDF versions. The CEO of DuckDuckGo seems to be involved in this, and he wrote a very interesting link warren for Medium. Thanks once again to David Lerner for discovering this. This is pretty much the antithesis of a posting I made in April titled "The Center is a Super Tribe...but Doesn't Know it Yet!". How did my perspective change so much so quickly? Three factors: 1. Extremism has accelerated in a chain reaction, which found detonation with the Brett Frigging Kavanaugh saga, 2. Less regular meditation, and 3. Ask me tomorrow, I might feel differently! To be a centrist in stridently divisive times doesn't provide the expected feeling of affinity for both sides. No conciliatory bridge of potential understanding. Rather, it feels like being locked in an asylum where everyone's ranting and raving 24/7 and there's no one sane to talk to. It's like being a high schooler disgusted with both the jocks and the nerds. Think of a child neutrally viewing her fighting parents in a state of dismayed isolation. From my perch here in ugly 2018, I send forward a suggestion: don't be a centrist. Choose a side (flip a coin!) and enjoy screaming your head off at the Bad Guys. Catalog their brutal stupidity and bad faith as proof of your side's superiority, which you must never closely examine. Do like the Israelis and Palestinians - always a fine model! - and commit to your marrow the atrocities of the Other, which shall justify your own righteous atrocities. Facing a bogeyman, there's no call for self doubt. That's why most people love a nice big fat bogeyman. There is no moral clarity clearer than the moral clarity of one's marrow. It practically sparkles. Him: I'm not a totally crazed nationalist, like some Catalans I know. Though I have to admit, deep down, I do feel a strong drive of that. I can't explain it rationally, but something about it just feels right to me. I've learned to recognize that a situation is seriously bad while also registering improvement. In fact, for extra points, I can even recognize when a situation has worsened amid an overall trajectory of improvement - which is, by the way, the foundation of resilience. My phenomenally non-resilient 25 year old self could not make such distinctions. There were no long arcs (which are usually hopeful), only immediate impressions (which are inevitably vexing). Why are American IPAs so bitter/hoppy? The simple answer unlocks everything you need to know about food/drink commerce in 20th/21st century America. American IPA is startlingly, intrusively bitter/hoppy so even the most undiscerning customer is convinced that the extra buck he's paid for his craft beer is worth that premium. The same thinking spurs upscale restaurants to offer linen napkins rather than paper. They justify the up-charge. Real estate is all about "location, location, location", but food service is "justify the upcharge, justify the upcharge, justify the upcharge". That's the whole game. If I serve you a cheeseburger on a linoleum counter with a paper napkin in a bustling atmosphere, I can't charge you $25. You know you can find the same in any diner for half that price. I haven't justified the premium. But if I conspicuously tart it up - with Wagyu beef, or some attention-grabbing herb, or melt a stick of butter into it to add luxurious je ne sais quoi, or have it served by a stuffy French dude in a tux, you don't need to be some feinschmecker gourmet type to accept the price. You must clobber customers over the head with the value-added. Subtlety doesn't pay. The task of craft brewers is to produce the least Budweiser-ish beer they possibly can. They compete to make the strongest, or darkest, or booziest, or weirdest brews. Whatever Bud is, their mandate is to do the opposite. American IPAs, truthfully, are nearly undrinkable unless one's palate has been so numbed that egregious over-hopping becomes tolerable. Hey, this stuff sure isn't Bud! Twenty years into the craft beer craze, a few maverick breweries are finally starting to produce unaffected, easier-drinking ("session") beers that happen to be wonderful, but not in any obtrusive way. They depend on discerning customers who'll up-pay for subtle beer that's superficially Bud-like...only much, much better. Likewise, in 1985, twenty years into the food craze (spearheaded by Julia Child), Danny Meyer opened Union Square Cafe, cooking what superficially seemed like same-old dishes. No status buttons were hit, but the food was subtly wonderful, and the hope was that a clientele would up-pay for unaffected greatness. It was a cheeky leap of faith, and it worked. Alas, Meyer subsequently lost his way (if one can say such a thing of a billionaire). His subsequent restaurants were mostly conventional upcharge justifiers, and then came Shake Shack, which started out as the original USC proposition applied to a much more populist dining segment, but very quickly came to epitomize the thing he'd fought against: the same-old, hyped/tarted up for a premium. Ah, well. Lots of people have tried to pull off upscale diner food. But none has done so quite like Beehive in Armonk. A Greek family has opened a Greek diner, erased every diner-ish vestige, and expects customers to pay a premium for unaffected deliciousness. There's no tarting up; no button-pushing. No truffle oil, nor do they Wagyu the bejesus out of the post roast. The basis of the menu is pretty conventionally eclectic diner-ish, but the room feels upscale, and the menu somehow feels likewise (despite the moussaka and gyro). And cooking quality is many cuts above the norm. I suspect I'm one of the few customers to recognize the underlying basis of the operation. The kitchen brims with small touches, none blatantly upcharge-justifying. Their bread - not particularly lavish, just extremely good - is from a tiny artisanal bakery in Williamsburg. I doubt even a single customer has heard of this bakery. There's no cred to be gained from the namedrop. Why are they doing this? It can't possibly be just for me...??? I can't quite fathom the fine line the kitchen walks. There's nary a whiff of conventional diner cooking, yet nothing's gussied up, either. Having patronized thousands of restaurants, I find it a delightfully provocative mystery. Pure chowhoundnip! Tantalizingly unable to frame what I'm eating, I'm driven into a tizzy by the Zen-like proposition of a not-diner (even the classic black-vested, white-shirted, dish cloth wielding counter waiter is more bartender/genteel than diner/brusque). More disorienting still, the region's stocked with acclaimed fine dining places, nearly all of them mediocre, making this a stark anomaly when it comes to cooking quality. One does not expect "touch" in a place like Armonk. It's as alien to this landscape as a hovering spaceship. Regardless of whether you buy the upscale veneer, or are hip to the underpinnings, I defy you to explain how in bloody hell they make the Thursday night $19.95 brisket blue plate so expressively flavorful. What kills me is that it doesn't taste like any other version I've ever eaten anywhere. Again: hovering spaceship! And what about the price? Should I deem it steep-for-diners (but well worth it)...or cheap-for-upscale (and an astounding value)? 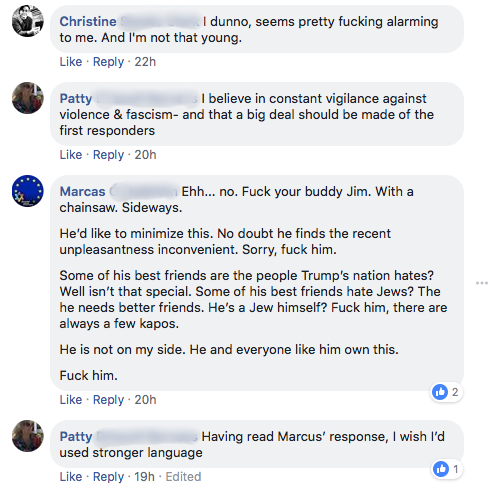 The Israelis are right. The Palestinian leaders have been awful - every bit as bad as the Israelis paint them. And Palestinians are right. The Israeli leaders have been awful - every bit as bad as the Palestinians paint them. The grievances on both sides are massive and legitimate. So anyone who surveys just one side's bad actions and concludes that the other side is noble and justified is being stupendously dishonest. There are no good guys. There's no side of righteousness. Pull back the self-delusion and it's quite obviously monstrous assholes fighting monstrous assholes, each sanctimoniously feeding off the sins of the other. I've been a political centrist for a long time now. I've always strongly disliked the doctrine and tactics of both the extreme right and the extreme left. And I've recently watched in horror as the moderate wings of both sides have collapsed and radicalized. But it wasn't until last week that I began feeling unpleasant and cynical, desensitized and clinical, in my view of the two sides of American politics. You know the feeling of anger and disgust you have in the pit of your stomach re: the Brett Kavanaugh saga, whether you're Democrat or Republican, pro or con? The distraught certainty that the other guys have reached a new level of loathsomeness? I absolutely feel that way about both sides. I've finally reached the point where it looks to me like there's no genuine righteousness on either side. Just monstrous assholes fighting monstrous assholes, each sanctimoniously feeding off the sins of the other. A year ago, I wrote a series of postings describing an extraordinarily strange period of my life that I refer to (with bemused irony) as "The Curse". Way more often than not, new people would have intensely negative and thoroughly inexplicable reactions to me. In my horror, I made myself increasingly quiet, mild, and timid, but that only seemed to make things worse. I've finally figured it out. It took sixteen years. This was the second hardest mystery I've ever cracked (the first was explained in a series of postings on theology and cosmology, which required forty years of rumination). Like many of the tangly questions I've set myself to answer, the outcome is forehead-slappingly simple. If you've ever played role-playing games like Dungeons & Dragons, you know about "reaction rolls". Whenever your in-game character meets a stranger, dice are thrown to determine the other person's reaction. Usually, it will be unsurprising. But, every great once in a while, a stranger will want to worship you...or else immediately attack you for no particular reason, even if they're normally peaceful. As in real life, it's a matter of bell curves and edge cases. Well, virtually all my reaction rolls were edge cases. I failed to mention the essential word: charisma. In Dungeons and Dragons, charisma is defined as "a character's force of personality, persuasiveness, personal magnetism, ability to lead, and physical attractiveness." And it affects all your reaction rolls....just as it does in real life. Ironically, I've always had charisma. I'm not handsome, and I don't invest sustained attention in my external presentation, so I'm not saying I project a lofty or admirable image. I've never been interested in seeming awesome, and the world has diligently respected this preference. But when circumstances require, some inner faculty ensures that I get what I need. I once nearly missed a flight home from Barcelona airport (traveling on three hours sleep, I'd nodded off in the terminal). The airport's comely security director, who I'd never met, rushed me to my gate, hustled me past the at-gate security check point and through the jetway, and by the time she deposited me in my seat, she and I were in love. I'm not joking. I'm often given free stuff, special favors, and rule-breaking slack. Not being a psychopath, I'm troubled by my potential for abuse and manipulation, and have worked to avoid anything like that. So whatever juju is behind this, I'm not "working it". It pops up, beyond conscious control, at needful times, and, thank god, it never winds up hurting people or leaving them at a loss. I'm convinced this is because I never reach for it or try to develop it. I simply leave it alone. That's a very strict rule I've set myself. So...I'm a person capable of high charisma who's deliberately opted to wield low charisma. It's nice when a million people feel emotionally involved with your operation. But a crowd that size unavoidably includes a few thousand emotionally disturbed emotionally-involved people. Chowhound was never quite a massive national sensation, so I'm not claiming I was, like, Kanye West. But I did get a solid taste of what it feels like when unhealthy people pay you too much attention, and it's not pleasant. I started keeping my private life very private, and playing myself way down among strangers. Charisma drop! This was also the point where restaurateurs were becoming aware of sensations like Difara Pizza, Kabab Cafe, Sripraphai, The Arepa Lady, Charles' Soulfood, and a number of other previously anonymous places I'd helped bring to wide attention. I'd always protected my food critic anonymity, but my countermeasures needed to escalate. I became ghost-like...which lowered my charisma. Worst of all, smartphones were appearing, so more people 1. carried cameras around with them and 2. could instantly share photos with large networks of people. I was one social media posting away from being solidly on-radar for a large-ish crowd of people I really wanted to evade. So between the crazies and the restaurateurs and the smartphone cameras, I felt increasing pressure to retract, recede, and blend in with the wallpaper. Charisma: throttled! Few people remember, but Chowhound started out as "Jim Leff, The Chowhound." I was never comfortable with it, and quickly remade the site as a completely non-hierarchical society. My opinions didn't rate higher, and I asked to be treated like just another hound, suppressing any impulse to assert special privilege. Again: lower charisma. Plus...I'd been asserting myself as a leader in order to manage a few dozen site workers, to serve as spokesman for press, and to recruit the large audience to begin with. I never realized I had leadership skills, but necessity worked its magic and I'd risen to the occasion. In the late stages of Chowhound, and into the transition to CNET's stewardship, I was happily letting that drop like useless weight. As I did so, much of my charisma dropped with it. Way more often than not, people would have intensely negative and thoroughly inexplicable reactions to me. In my horror, I made myself increasingly quiet, mild, and timid, but that only seemed to make things worse. My shrinking strategy just compounded my negative charisma. As so many of us do, I'd instinctively reached for a solution perfectly designed to worsen the problem (sort of like how people crave the foods they're allergic to). This caused a death spiral. Once I'd finally left CNET a year after it had acquired Chowhound, I felt like Frodo returning to the Shire. No one could possibly understand what I'd been through, so I decided to just let myself be the completely random shlumpfy dude I've always conceived myself to be as a child of suburban paneled rec room basements, foosball tables, and Captain Beefheart records (my people are the Howard Stern people; the UPS delivery guys; the frickin' guys who use the word "frickin'" and who eat slice pizza while driving). This wasn't the cliche of my hiding some amazing secret about myself, because I'd found the experience excuriciatingly non-amazing. But while my neighbors had built self-esteem via successful track records as administrative assistants or contractors, I was weirdly larval/neutral. A doofy pizza scarfer blinking vacantly in post traumatic bemusement. Very very low charisma! When the Curse appeared, I was doing a lot of meditation and other spiritual practices which create a sensation of intensity and energy. Worried I might be inadvertently cultivating the juju, I became extra diligent about my non-manipulation rule. This parsed as lower charisma (charisma is manipulation!). Also, the more spiritual stuff you do, the less selfish you become. When you're no longer primarily serving your own needs and outcomes, charisma can scab over. After a lifetime of desperately trying to impress people, I just grew tired of it - and stopped seeing the need for it. I knew what I was good at and what I wasn't. I had an accomplishment I could namedrop, if absolutely necessary, to justify the space I occupy and the air I breathe. And I didn't feel any hunger for external corroboration. This sort of psychological settlement is something a lot of middle aged people undergo, and as any younger, status-obsessed observer would attest, it really lowers a person's charisma. A little charisma buys you benefit of doubt. A lot of charisma buys you an epic romance amid a ten minute airport security interlude. Zero charisma buys you a spot at the bottom of every ladder and the end of every line. But negative charisma inflames suspicions, fears, derisions, and projections of every possible sort. While charisma creates smiles, anti-charisma invites snarls. The world merely ignores a zero, but it actively persecutes negatives. Anti-charisma is the curse of all curses. So....be careful about letting your charisma drop too low! And if it happens, don't retract and recede. Don't try to relax into this ("letting go" is a fantastically handy and versatile trick, but it's not an all-purpose panacea). Even though it feels like the universe is punishing your assertiveness and commanding you to pull back, that's not it at all. Assert MORE. Push back (friendly, not angry). Gear up, psyche up, hoist up. Light your fire and aggressively thrust your way back to the positive numbers*. It's counterintuitive, but it's the only way to escape the vicious circle and rejoin civilization. * - Also, don't forget this.